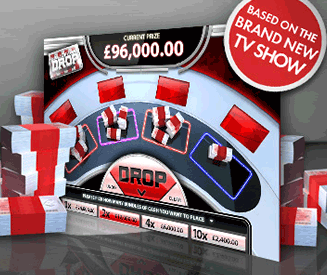 "The Money Drop" is just like The Million Pound Drop game on Channel 4, minus the questions and any skill. Despite that, this Million Pound Drop online game is annoyingly addictive. The "okay, just one more go…" factor is deceptively high. The trapdoors are totally randomised instead of you having to answer questions to guess the correct trapdoor. However, with the opportunity to win 960 times your original stake, you’re compelled to try out different strategies in different games to see how they work. Fact: You can win up to £96,000 in one game playing The Money Drop. You can play conservatively and pick up lots of small wins, or go for broke and smash it all on one trap door each round for a massive win. It’s all part of the fun. The Money Drop fun rating - 94%. Without the questions and skill, you might think that the best elements of this online version of The Million Pound Drop have been ripped out, and I would have probably agreed with you before I played the game. Even though the results of each game are based entirely on luck, it’s amazing fun being able to control where you put your money and how much of it you risk at a time. Choosing your strategy and sitting nervously as you anticipate the drops is an excellent feature, and it’s one that’s entirely unique to this game. You really need to try it out to see what I mean. It's comfortably one of the best online games for real money out there at the moment. The basics of The Money Drop game. 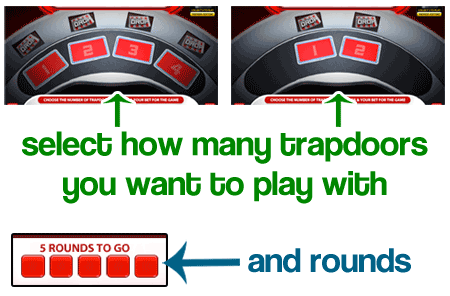 Choose the number of trapdoors you want to play with on each round. Choose the total number of rounds in each game. Choose how much money you want to wager in each game. Place however much of the maximum win you have across any or all of the trapdoors. Try and finish the game with as much money as possible. That’s pretty much the bare bones of this "The Million Pound Drop" game online. It’s a lot easier to just play it for yourself though than for me to to explain how it works. Try it out. The more trapdoors you play with, the bigger the maximum win. The more rounds you have in a game, the bigger the maximum win. As I’ve mentioned before, a cool aspect of The Money Drop is its flexibility. Not only to you get to choose how and where you risk your money, but you also get to choose the structure of the game. If you want to maximize the biggest possible win, then go for the highest number of trapdoors and rounds. It’s more fun that way anyway. The Money Drop online game is based entirely on luck, so there’s no real strategy to help you win more or lose less. It’s about how lucky you get on the day. As a rule of thumb though, the greater the risk the greater the maximum win will be. Fact: The chance of putting all of your money on to one trapdoor and correctly guessing the right one for 5 rounds (with 4 trapdoors) is 1 in 1,024. If you spread your money out fairly equally across all of the trapdoors in each round, you increase your chances of winning some money at the end of the game, but you reduce the maximum possible win. For example, if you played a 5 round game with 4 trap doors and spread your money out equally across those 4 doors (making it impossible to lose) in each round, you would actually be making a small loss in each game (although you would be getting some money back). If you were to wager £1 using this strategy, you would have a guaranteed return of £0.96, which is a small loss. Therefore, you have to take some risks to win more than you wager. Alternatively, if you played a 5 round game with 4 trap doors again, but this time put all of the money on one door in each round, you could win 960 times your stake, which is the maximum for this game. As a result, if you wagered £100 on one game and you were successful in this high risk strategy, you could end up walking away with £96,000. Not bad for a quick game of The Money Drop.